We've been having fun with the dinosaurs the last couple of days but today we're switching gears and featuring this beautiful Fall card by Design Team Member Jocelyn Olson using the Wagon of Wishes stamp set! The shocking thing about this card is that Jocelyn didn't use the wagon! GASP! Crazy, right? But I love how pretty this turned out... She repeated the leaf pile stamp to make that beautiful background! It's also so neat how she stamped the happy Harvest Sentiment on a ticket! Thanks so much Jocelyn, for the new look at this set! Make sure to go over to Jocelyn's blog, Red Balloon Crafts today and tell her what you think! If you'd like to purchase the Wagon of Wishes set for yourself you can find it in our online shop at www.newtonsnookdesigns.com. omg this card!!! it's amazing!! i LOOOOOOVE that background! eek!!! so cute!!!! 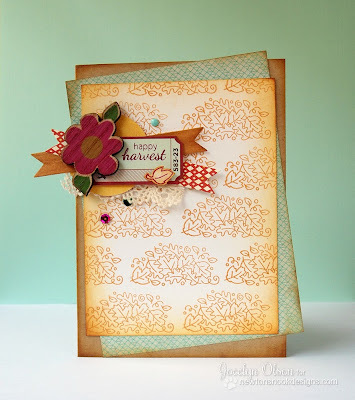 wow that background looks really pretty...great idea for using the stamps in a different way.